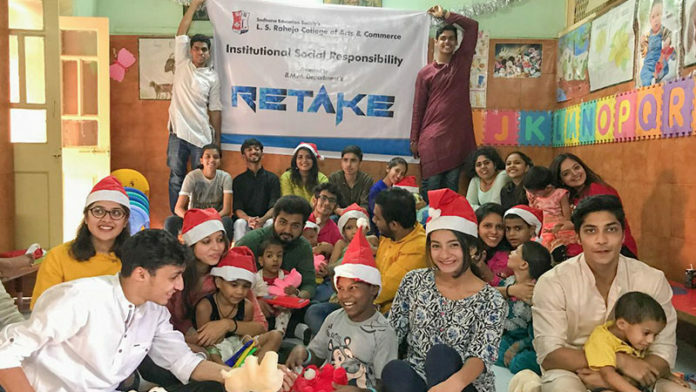 The BMM department of L.S Raheja college celebrated Christmas with the children of Missionaries of charity, an orphanage in Vile Parle on the 23rd of December. It was a day of joy at the orphanage home when the students visited with presents and cakes for the children. The students wanted to make these holidays memorable for the less privileged children. “This is the season of Christmas and the children deserve to be happy, we just wanted to do our bit and share whatever little we have to spread the cheer.” said one of the student. Amongst the items donated were soaps, washing powders, bags of rice and dal, clothes, toys, toiletries etc. to support the day to day running of the orphanage home. The students also sat down with the children for more fun and games. This was a part of their ISR. The day ended with everyone including the sisters coming together to cut a cake. The preparations for Retake are going on a full swing. ‘RETAKE’ is the mass media fest of L.S. Raheja College of Arts and Commerce. This is their 4th edition which will be held on the 18th and 19th of January, 2019. The BMM department of L.S.R.C is determined to take the festival to a new high this year. The students are eager to welcome other colleges and give them two memorable days of fun, thrill and excitement. Faulty 4G Connection? Don’t Worry Just Go To The Moon!